Paw paws are a mystery to most people. Most think they are papayas, Carica papaya, native to the tropics and beloved of Baloo the bear in The Jungle Book. That’s not the fruit I am talking about. I am talking about Asmina triloba, the American paw paw, a/k/a Hoosier banana or custard apple. They are native to the East and Midwest and happen to be our largest native fruit. Paw paws live in wet places – notably along riverbanks – from New York to Florida and west to the Great Plains. They are the only non-tropical member of the asmina family, which includes the soursop and tropical custard-apple. Paw paws are typically a small, spindly tree with leaves that look too large for the tree’s size. They tend to grow in mass clumps in the dappled shade of larger trees. I first encountered paw paws many years ago, along the banks of the Rappahannock River in Virginia while looking for good places to catch herring and shad from the riverbank. I was bushwhacking toward the water when I found myself in a grove of what, superficially, looked like palms growing underneath the canopy of elms and maples. They had oversized leaves with the floppy habit of palm leaves, although they were not fringed like a real palm leaf. But these “palms” did have shriveled growths on them that resembled a rotten banana. As it happens, that’s what they are. Sorta. I had an inkling that this might be a paw paw, so I looked up this plant in Euell Gibbons’ Stalking The Wild Asparagus and it was, indeed, a paw paw. I marked the spot and returned in September, and there were the ripe green “bananas” all over the trees. I could have found them blind, because of the aroma. The best way I can describe the smell of a paw paw is that it’s like a girl’s first perfume: Tropical-floral and intensely sweet, cloying, almost. And powerful! Oh man, bring a sack of paw paws home and your house will smell like the inside of a candy factory in less than an hour. Wuff. When I first brought home a stash of them one day, I was almost overcome. I would up putting them on the porch overnight, and a raccoon came and ate them all. I went back and got some more and let them ripen. Like a banana, they ripen from green to yellow to blackish. 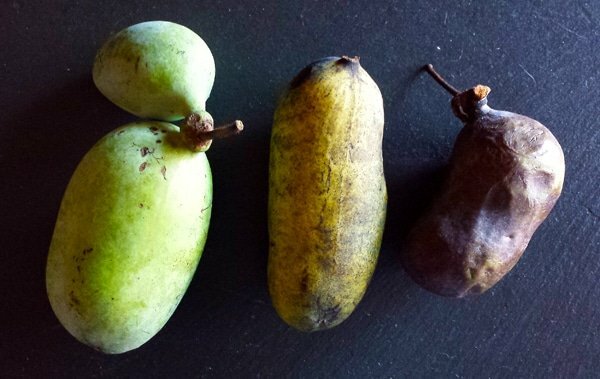 As for flavor, they taste like a cross between bananas and an overripe pear, and the texture is soft and custardy, like lemon curd or an avocado. The color is a rich yellow, like a buttery custard or good French vanilla ice cream. Thus this recipe. I am proud to say this one’s a winner. It was pretty simple, actually. 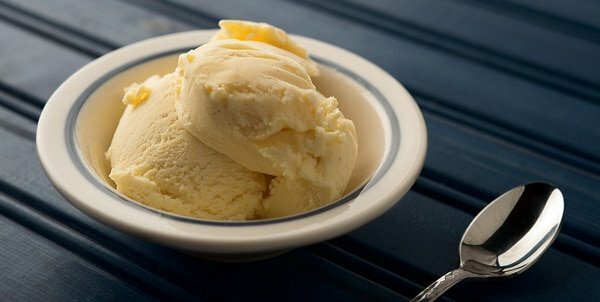 Make a standard French vanilla ice cream and add mashed ripe, paw paws, then churn. 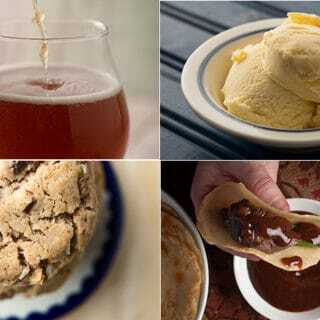 Obviously this is a recipe focusing on North American paw paws, but I am pretty sure banana would work just as well, although the flavors would be very different. Fresh or frozen paw paw mash will work, so you can make this anytime if you have some squirreled away. Use really ripe paw paws here -- the blackish ones. This is essentially a French vanilla ice cream with paw paw added right at the end. The only tricky part of this recipe is tempering the egg yolks, and that's not exactly rocket science. You just need to add the hot cream in small doses while stirring the beaten yolks. I'd eat this ice cream within a few weeks. The longer it sits in the freezer, the hard it gets, and it can get icy over time. Start by making the custard for the ice cream. Heat the cream and milk and sugar in a pot over medium heat to the steaming point, about 165°F. If you are using a real vanilla bean, add it to the mixture now. If you are using extract, wait a bit. Beat the egg yolks in a bowl. Stirring the eggs all the time, add one ladle of the hot cream mixture into the eggs. Do this a second time -- this is tempering the eggs so they don't curdle in the hot cream. Pour the egg mixture into the pot. Stir the custard often and heat it back to the steaming point. 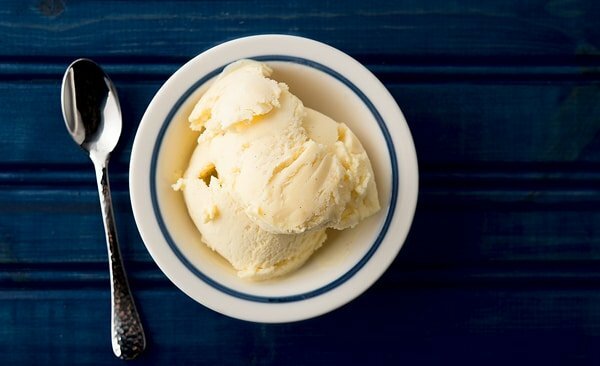 When it thickens -- it should coat the back of a spoon -- turn off the heat and pour the custard into a bowl. I like to set the bowl into a larger bowl filled with ice to cool the mix down quickly. Stir in the vanilla extract if that's what you are using. When the custard is cool, whisk in the mashed paw paws until they are well combined. 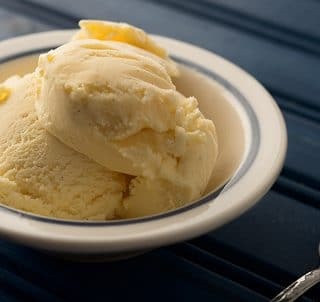 You can put the mixture into your ice cream maker now, or you can push it through a fine-meshed strainer to remove any stray bits; you'll need to fish out the vanilla bean if you used that anyway. Run through your ice cream machine and eat! Note that prep time does not include chilling time after you make the custard. You can find a host of recipes for ice creams using wild and foraged ingredients here on Hunter Angler Gardener Cook. Any tips for keeping the fruit orange rather than it turning brown as I blend it up? I had pulped the fruit, stored it in the freezer, then put it in a food processor to smooth it out. Elizabeth: Only thing I can think of would be to add Fruit Fresh, e.g. citric acid, to the mix to prevent oxidization, which is what is happening.